Have you ever re-used an empty iced tea or other glass bottle as a water bottle? We have. That's why we were so excited when we found these new glass water bottles. They're a bit of a blast from the past (aka glass milk bottles) but with a modern twist - a funky and colourful silicone sleeve. As soon as we laid eyes on these water bottles, we knew we had to have them. 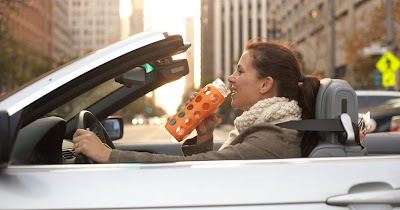 Here are five reasons to drink from a glass water bottle rather than a plastic or metal one. 1. Glass is one of the greenest materials on the planet and is 100% recyclable. It has been a trusted material for centuries. 2. Glass is completely safe. You don’t have to worry about BPA, phthalates or other harmful chemicals that can leach into liquids from plastic bottles. 3. With glass, there's no after taste. Water and other beverages taste better coming out of a glass bottle because glass is taste neutral - no unpleasant plastic or metallic taste. 4. Glass is transparent so you can see all around the inside of the bottle. You can ensure that it's extra clean every time you take a sip. 5. They can look so cool - especially with a colourful, non-toxic, easy grip silicone sleeve and a contoured shape - you won't want to be without one! 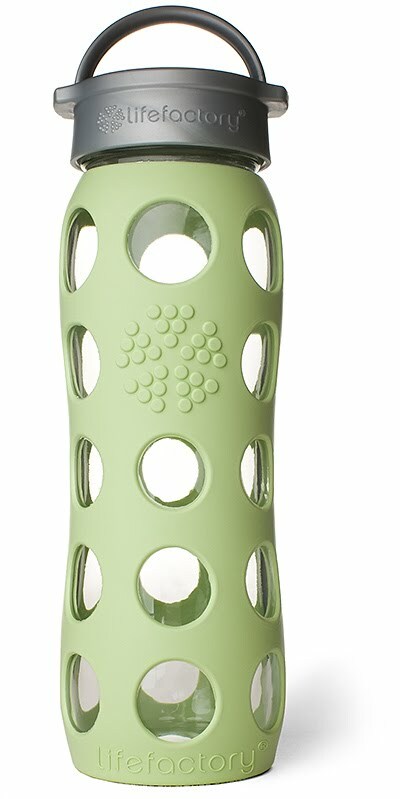 And if you're concerned about breakage with glass, don't be - at least with our new water bottle. Staff from the San Francisco Chronicle dropped the bottle repeatedly onto a concrete floor without a crack, thanks to the protective silicone sleeve. 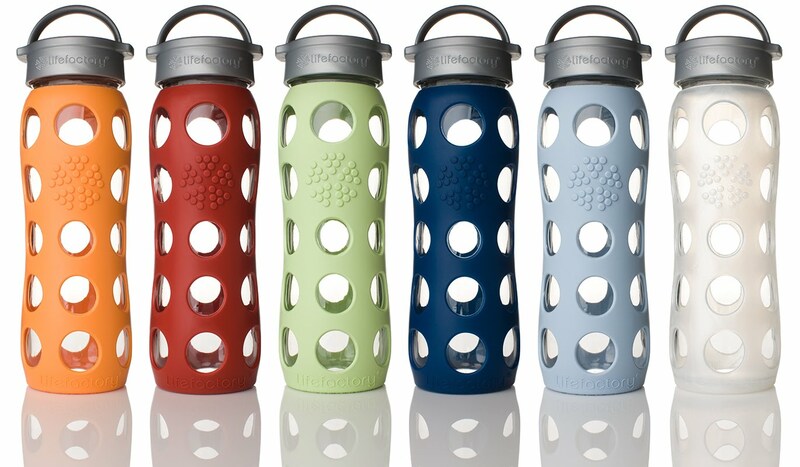 Our new glass water bottles are available in six funky colours. They're custom made in France, with the cap made in Poland. The silicone sleeve is made in the US and the entire bottle is assembled there too. The glass and top are both recyclable and the silicone sleeve can be returned to us. We'll make sure it's forwarded on to where it can be re-ground to make outdoor playground mats or mats for barn animals. Glass water bottles are available at Vancouver-based eco boutique Lavish & Lime where you'll find these and more ideas about living life a little greener. If you have any thoughts or ideas about glass water bottles, please leave a comment below. We'd love to hear from you! These are great. I hate the taste in my stainless stell bottles. I will be getting one for everyone in my family. I'm really interested in the glass bottle but my concern is, what is the cap made of? I'm trying to avoid plastic, rubber completely. Looking for a 100% safe glass bottle. Your website is Kuzey Güney probably the most interesting places relating to this. Kırmızı Eşarp Usually, I've got to do preliminary research about this as a result of my occupation. Sensiz Olmaz I often find your insights right on point and it helps save me a great deal of time when I require fresh Yalancı Bahar ideas. Indeed very good article! I am so delighted to found your blog. Thanks for sharing the nice information. Really, I've enjoyed to reading your blog. All five reasons to drink from a glass water bottle rather than a plastic or metal is awesome.